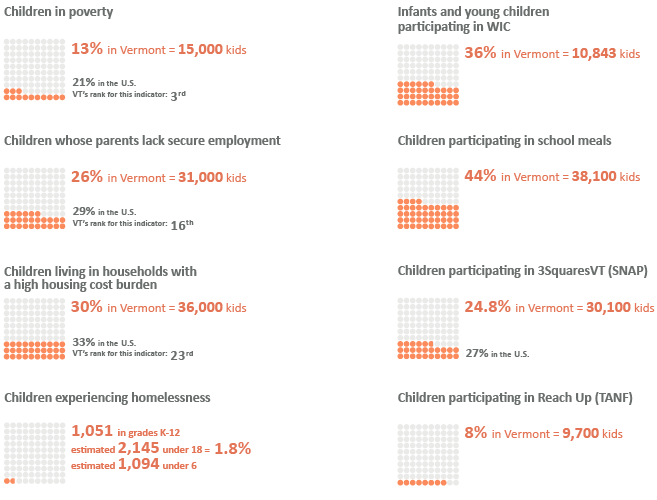 Vermont consistently ranks among the states with the lowest child poverty rates, above-average median family	income, and higher than average accessibility of safety net supports for low-income families. Recent census numbers show promising gains in median family income, employment, and poverty rates. From 2014 to 2015,	the child poverty rate dropped 2.6 percentage points, with 3,350 fewer children living in poverty. But inflation-adjusted incomes have still not recovered from pre-recession levels for the bottom 60 percent of households in	the state, and the child poverty rate and percentage of kids living in low-income families remain higher than in 2007, before the start of the Great Recession. Low-income households were hit the hardest by the recession, while the highest earners came out ahead. The bottom 20 percent (lowest quintile) of households saw their real incomes drop $817 between 2007 and 2015, and the second quintile lost $1,547 in the same period. At the same time, the highest quintile of earners saw their real incomes increase by over $8,000. The top 5 percent of earners have seen their inflation-adjusted incomes go up by more than three times that amount. Recent census data offers hope that these trends are reversing. Between 2014 and 2015, the bottom 20 percent of earners saw their incomes increase by 8.4 percent, a larger increase than any other quintile. But these gains must be sustained to make a real difference to low-income families: if the average household in the bottom quintile saw the same income gain every year, it would take until at least the year 2020 for them to move past the poverty threshold for a family of three. The same family would need an additional decade to see the same $25,237 increase in earnings that the top 5 percent gained since the beginning of the Great Recession. Tight budgets create difficult choices for Vermont’s low-income families, and an increasing number of low-income families are operating on small margins, despite having one or two full-time wage earners in a household. Mirroring national trends, Vermonters have seen housing, healthcare, and heating costs grow significantly faster than wages. Half of all renter households and a third of all owner-occupied households pay more than a third of their incomes—a common threshold for measuring affordability—toward housing costs. Families struggling with unaffordable housing costs often face impossible choices between essential expenses. In Vermont, harsh winters make heating costs a crucial budget item, but we are consistently the least affordable state in the country when energy costs are measured as a percent of household budgets.